Just as diamond ring is needed in marriage, NuA4/Tip60, a complex with diamond ring architecture, is required for regulatory and repairing processes. Prof. CAI Gang and Prof. Jacques Côté's team reports the 4.7 Å structure of the yeast NuA4/TIP60 complex, which elucidates the detailed architecture and molecular interactions between NuA4 subunits. Related study is published online in Nature Communications on March 19th. NuA4/Tip60 is a complex which catalyzes diverse substrates critical for gene regulation, DNA repair, and cell cycle progression. Yet its compositional complexity and conformational flexibility have long impeded researchers from exploring at high precision. 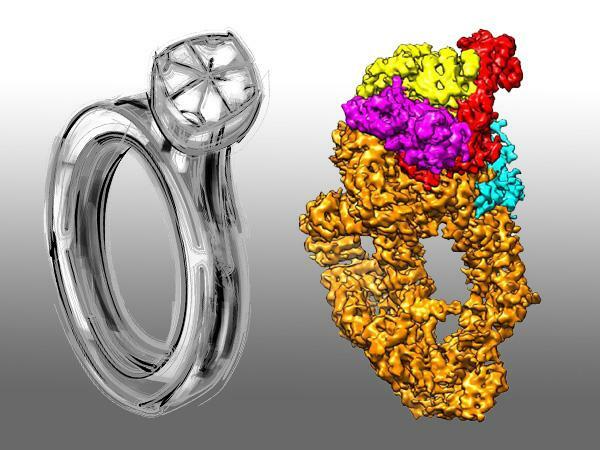 By utilizing cryo-electron microscopy (cryo-EM), CAI Gang's team provides a high-resolution view of this complex in sub-nanometer scale, and discloses how NuA4/Tip60 assemblies for the first time. The 4.7 Å resolution structure illuminates Tra1/TRRAP and Eaf1 serve as a scaffold for NuA4/TIP60 assembly. Although Tra1/TRRAP lacks of kinase catalytic activity, it adopts active conformation of the catalytic domain in NuA4/TIP60 assembly. Besides providing more insights about scaffolding and regulatory mechanisms of Tra1/TRRAP, the structure elucidates more details about NuA4/TIP60 subunits. Unexpectedly, the structure also shows human TRRAP mutations are largely centered on the Tra1/TRRAP interaction surfaces mediating NuA4/TIP60 assembly. Since Tra1/TRRAP contains hotspots for tumorous generation, this observation warrants preventing cancer by targeting the scaffolding function of TRRAP. In addition, since Tip60 is significantly down-regulated in many cancers (i.e. breast and prostate), specific inhibitors of Tip60 will promise major breakthrough in cancer treatment. Talking about future plans, CAI Gang will focus on obtaining structure of the holoenzyme and determining the substrate specificity and catalytic mechanism of NuA4/Tip60. These could greatly facilitate the development of specific TIP60 inhibitors and potent chemotherapeutic drugs, aiming at treating more people suffering from cancer.